The highest-grossing charity auction occurred in 2012. In an annual eBay fundraising auction run by Kompolt (a division of Cause Media Group), billionaire Warren Buffett donated a private lunch to benefit the Glide Foundation in New York. The 2012 auction grossed $3,456,789. Oprah Winfrey has jumped onto eBay with a bang! In 2003, to fund her charity, the Angel Network, Oprah auctioned two chairs from her set. These were not just any chairs. Aside from being luxurious leather chairs designed by Ralph Lauren, they had housed the behinds of famous names such as John F. Kennedy, Jr., Halle Berry, Tom Hanks, Jim Carrey, and Michael Jordan. The 7-day auction netted the charity an amazing $64,100. In 2010 through this year, the media mogul cleaned out her own closet for her Leadership Academy for Girls. To celebrate Chivas Regal’s 200th year, the company chose eBay for CHIVAS 200, the largest online charity auction in the world. From September 6 to October 31, 2001, the Chivas folks auctioned more than 200 of the world’s most-wanted items and experiences — such as an opportunity to become a Russian space-station cosmonaut — all for the benefit of charity partners around the world. Music producer and singer Pharrell Williams decided to put his famous Vivienne Westwood park ranger–style hat up for sale to benefit his non-profit organization, One Hand to AnOTHER. Pharrell wore the famous hat during his performance at the Grammy broadcast in 2014. Folks commented that the hat resembled the logo for the Arby’s restaurant chain, so he tweeted through his Twitter account @Pharrell, “Hey @Arbys, you want my hat?” He started the listing on eBay for $200 (what he paid for it), and it did eventually sell to Arby’s for $44,100. Arby’s thanked Pharrell for the return of their hat on Twitter. 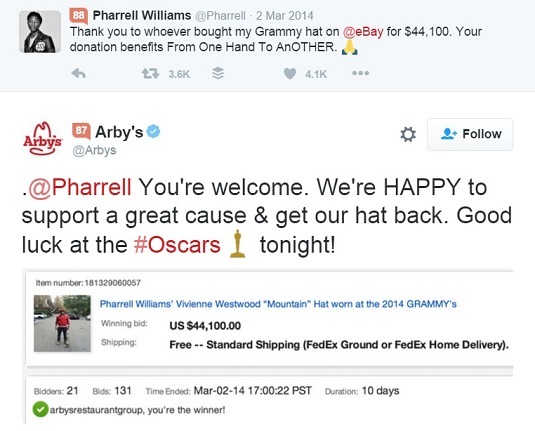 Arby’s remarks to Pharrell on Twitter that they are happy to get their hat back. All four stars of The View autographed a coffee cup that was auctioned off on eBay to benefit UNICEF. Over $1,000 was raised on eBay for a single coffee cup! Now that a couple of the hosts have moved on, that little cup might be worth even more.